The Siberian Husky is thought to originate in Siberia where they were bred by Eskimos to pull a sled (or sledge) over the snow. They were kept by the Chukchi Eskimos whose occupation was herding reindeer. The dogs had to have great stamina to pull loaded sleds over long distances. The thick, double coat kept the dogs warm in the snowy wastes. Joanna Gusarevich, Tel: 0437212454, cell: 0739666456, e-mail: belukhasibes@yahoo.com, webpage: Belukha. The word "husky" covers all the sledding breeds. 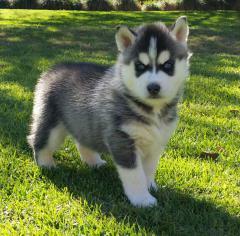 Alaskan Malamutes, Samoyeds, Eskimo dogs, and gimmiq's are also huskies. Fur traders took Siberian Huskies to Alaska where the breed was developed for the sport of dog sled racing in the early 1900's. These lively, outdoor dogs need a big yard and lots & lots of exercise. Not an aggressive breed, they get on well with people, and would enjoy being "worked" in a training class. They are friendly, outgoing and mischievous. Siberian Huskies are still used today as sled dogs and for the sport of sled-racing. Six dogs are often harnessed together. The Siberian Husky is a medium-sized, strongly built dog. He looks a little like a fox, with erect ears, sharp, alert face, and bushy tail. The eyes can be brown, blue, or mixed colours. Colour: any colour and markings. 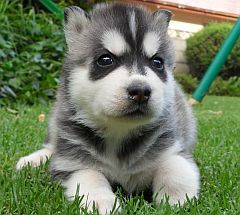 Huskies, and some other breeds, often have eyes that are different colours. Height at shoulder: males 53 - 60 cm, females 51 - 56 cm. 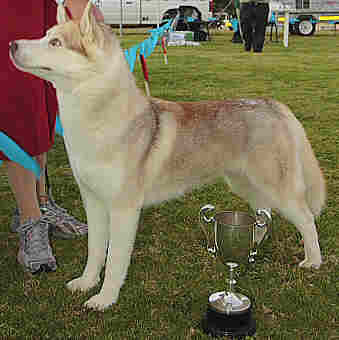 Siberian Husky owned by R. Herselman. Photo by Paul Greenway, Grahamstown dog show, South Africa. 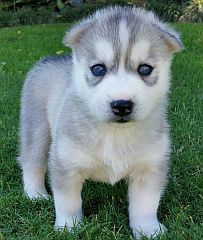 A diluted black siberian puppy bred by Tolcketna. Husky Joke: "Unless you're the lead dog, the view never changes." Siberian Huskies have a dog's life, harnessed together like slaves, pulling heavy loads across the bleak, freezing snow - yet they love it! They can't wait to work! Let's be huskies! Let's do our work with enthusiasm! The Bible says, "Workers, obey your bosses just as you would obey Christ. Serve wholeheartedly as if you were serving God, not men."